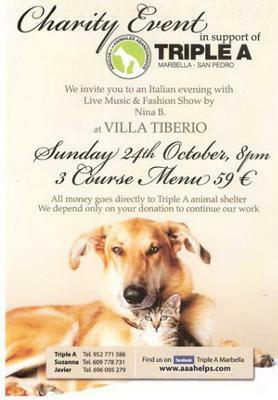 Enjoy an evening out at the Triple A charity dinner held on Sunday October 24 at 8:00pm at the Italian restaurant Villa Tiberio. This €59 euro three course dinner raises money for the abandoned animal association in Marbella that normally functions solely on donations. The evening promises to entertain its guests with Italian music and a live fashion show by Nina B. All proceeds from this event goes directly to benefit Triple A.
I want to say thank you to all the people that helped giving us presents for our raffle and to all the people that came to our charity dinner. We collected 9.000 euros for our dogs and cats. More than 200 people were supporting us. Our dogs and cats love you. I would like to thank the organisers, especially Suzanne Joh, what a lovelly evening and I hope you raised a good amount for a wonderful Charity. We have had with several friends of ours a great, great evening. We were enjoying the atmosphere, the food, the fashion show, the sound of the singer Joost Jong etc. I still had a big waiting list. Next time we come with a lot of people. Last but not least, it brought a lot of money for Triple A and that is the most important part of the evening.